Light your way. We have all driven by that one house that looks beautiful during the day but once the sun goes down it is simply breathtaking. What exactly makes it look so different and appealing after dark? The lights, the direction the lights are shining, the way the driveway if lit and the focus lights on the landscape features. With Led lighting you can now achieve the same beauty for relatively low maintenance and cost. You can even add a little color to your lighting plan. When adding lighting to your walkway keep the lights low to the ground to avoid any glare, use LED strips that can be hidden by adding a lip or edge to your walkway. If you don’t want to add the edge no worries the tradition lights can be used or you can use a recessed lighting that can be buried and flush with the ground. Take it step by step. Lighting your steps not only draw the eye to the beautiful front door but are practical as well. These lights need to well-placed and positioned so that they are illuminating your way and not blinding you. 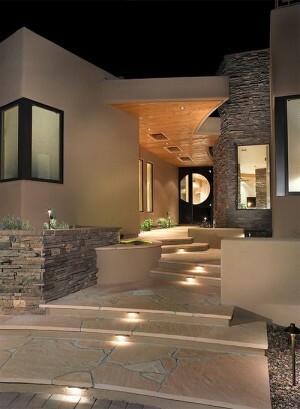 Again you can use the LED strips or a light that have a cover over them that helps direct the light towards the steps. If you have a deck or wooden steps with a trailing you can purchase newel post deck lights that highlights the railings and gives you a soft light on the steps. What was old is now new. Using lanterns is quickly becoming a trend. They are beautiful, stylish and gives your home an elegance. You can add scones that look like lanterns or a actual lantern light to illuminate the front door. Something you might want to remember is that clear glass and bright bulbs can cause a glare. Since your lighting in your home is not a bright if you have a bright bulb over your door will blind you when you open it. Choose a lantern with frosted glass that will direct the light down where you actually need it. Chose a softer bulb or even go with a bulb that doesn’t attract the bugs. If you have a lantern with a open bottom you can now get bulbs that are bug zappers. Highlighting your curb appeal will not only make you proud of your accomplishment but if you are in the market to sell your home it will also help to sell it.